I’ve cut out a lot of sloths this past year. The one I created for this video was by far the most memorable, thanks to the mechanics involved in shooting a time-lapse. The camera was programmed to shoot every 5 seconds and so coinciding with each shot came a blast of light from the strobe. That awareness of time passing in the form of strobes makes for a very interesting art-making experience. The pressure felt kind of similar to writing a high school exam with minutes ticking away. So thank you, Kevin, for making this time-lapse possible and for reminding me how long my art actually takes. And thank you to Allison MacLachlan and the rest of the Owlkids team for putting this video together to help promote Kyle Goes Alone. If you want to see more videos like this, I suggest checking out Owlkid’s new hub for behind the book features called The Inside Track. It’s an especially great resource for teachers and librarians. Last year around this time, my life seemed to revolve around this desk. 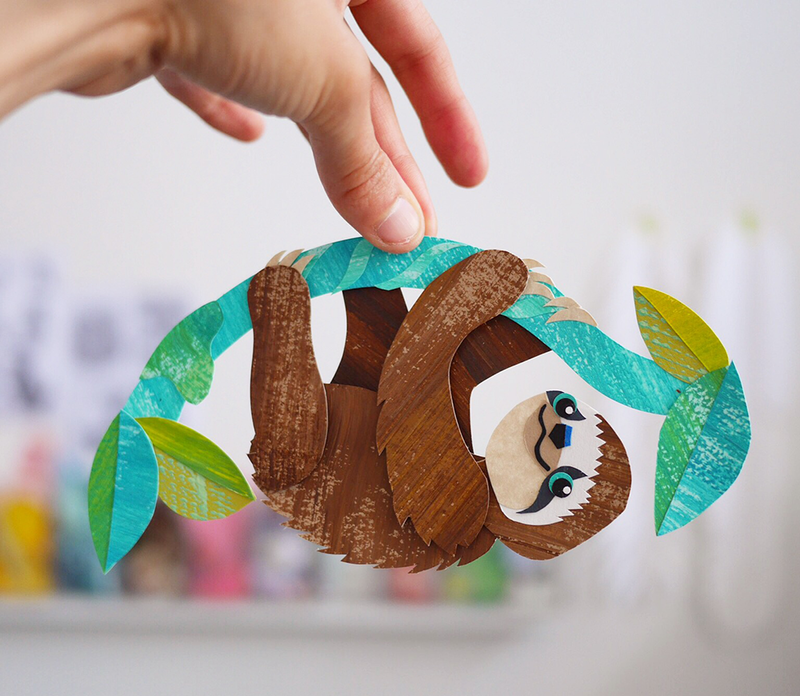 Amidst piles of green and blue painted sheets of paper, penciled up tracing paper, stacks of book-marked reference materials and a confetti explosion of foliage and vine pieces, a little sloth named Kyle was being born. Kyle was initially shy and fearful of the vast rainforest I was creating around him. All of those blues and greens made him feel cold and lonesome. His little brown body eagerly clung to the vines I cut for him. Little by little, and I mean little, I introduced some friends into the scenes for Kyle to meet. Some had six legs. Others had two. Some were green while others were red. And some had tiger stripes even though they weren’t actually a tiger. I didn’t want to startle Kyle, so I made sure to introduce the friends gradually, only showing pieces of them at first. Can you spot two in the scene below? After a while, something changed in Kyle. The greens and blues of the rainforest didn’t feel cold and lonely to him. A little smile even started to form on his face and he was ready to share his story with the rest of the world. 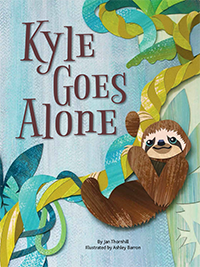 Kyle Goes Alone is a delightful story about a baby sloth’s first taste of independence and how he overcomes his fear of “going alone”. It’s written by Jan Thornhill, published my Owlkids and illustrated by yours truly. I hope Kyle finds his way into your heart as he has mine. Last year around this time, I was finishing up the final artwork for Sizing Up Winter. The cover features a river otter slipping down a snowy slope into an icy pond, which is meant to be a close up of one of the inside spreads (pictured below). It was a struggle to recreate the river otter’s likeness. Their colouring and proportions have to be just so, or else they end up looking more like seals or bears or groundhogs, even. After a handful of revisions and tweaks to the cover otter’s face and body, I was finally satisfied and all was completed and sent to the publisher. I was far from done illustrating otters as you’ll see. Soon after, I found myself working on a third otter piece. This time it was a gift for my boyfriend, Kevin. Inspired by one of his otter drawings, I set out to recreate a similarly lush seaweed setting by recycling some paper greenery from a past project involving two goldfish (you can view it here). It was pretty clear by now that I secretly enjoyed the trial and error process of recreating this puzzle of an animal. A couple months later, and I was back on the otter track. I began working with Crush on another animation project, this time for Seattle’s Woodland Zoo. My job was to stylize each of the featured zoo animals, giving them a simplified, geometrical, Charley Harper sort of look. Among the long list of animals to be drawn was the Asian Otter. “Oh goody”, I remember thinking, as I was quite confident in the otter department by then. It was the quickest turn-around drawing I had ever made, and for good reason I guess. The lion cubs were another story! Crush designer, Jullian Ablaza, would later transform each of my drawings into beautifully rendered vectorized art. (You can see an example of our process to the right.) Jullian did an amazing job with palette and pattern, and inspired me to consider using a little adobe illustrator in my future art projects (a skill I hadn’t quite mastered yet). 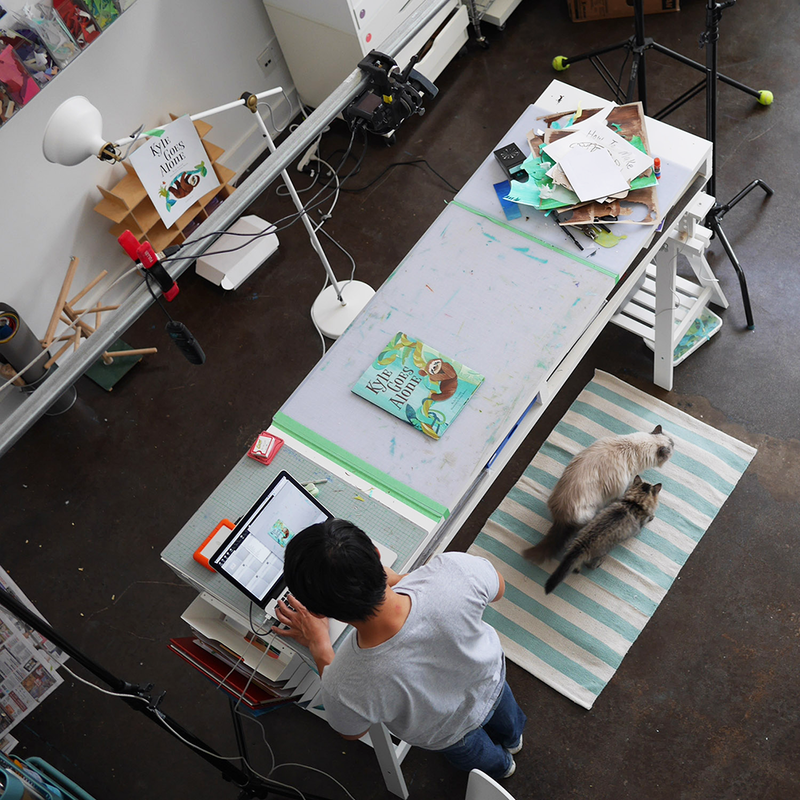 As well as designing some of the animals, animator Yoho Hang Yue, really brought everything to life! You can see for yourself in the final Woodland Zoo piece below. So if 2013 was the year of the otter, I wonder what’s in store for 2014? I’m a little late to announce the release of my new book and I fully blame it on the summer-like weather we’ve been having here in Toronto. It just didn’t seem right to be posting up imagery of snow and ice on a warm, sun-soaked autumn day. So now that the wind has picked up and I’m wearing a cozy sweater, might I present you with the third book of the Math in Nature series, Sizing Up Winter. Below is a sampling of some of my favourite pages. I recommend sipping on hot chocolate while reading this book, as the content is quite chilly. For details on purchasing this book, you can visit the Owlkids Store. For a signed copy of “Sizing Up Winter”, “Sorting Through Spring” or “Counting on Fall”, please feel free to email me at hello@ashleybarron.com.